Fiction – paperback; Faber and Faber; 83 pages; 2003. Review copy courtesy of the publisher. 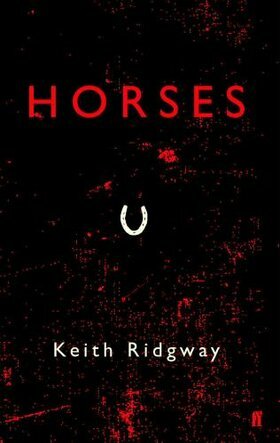 Keith Ridgway’s Horses was first published in 1997 as part of a Faber and Faber anthology of new writers, but was then reissued as a standalone novella in 2003. At just 83 pages it makes for a relatively short but undeniably powerful and atmospheric read. I first heard about the book via John Self, who reviewed it earlier this year. John drew comparisons with John McGahern, my favourite writer, because of the book’s “rural setting, the close-knit community, the febrile relationships, the broodings – resentment, regret, revenge – at the heart of many motivations”. But John also said that “the violence and bloodletting which seeps through it would never have suited McGahern’s low-key style”. I have to agree. The prose is reminiscent of McGahern, with its gentle rhythms and musicality, and even the characters, particularly the trinity of policeman, doctor and priest, could easily have fallen out of one of his novels. But there’s an edginess, and a black sense of humour, in Ridgway’s work that marks him out as his own man. The story is set on one particularly wild and stormy night in an unnamed village south of Dublin. An arsonist has burnt down the local cinema, Gill’s butchers and Dr Brooks’s stables. Three horses, of the title, have died and their owner, a teenage girl called Helen, is distraught. Who is to blame? This perfectly paced story, with all its twists and turns, is a joy to read. A dark, complex and occasionally witty tale about grief and revenge, Horses is also about small communities and the secrets they keep. And it marks Ridgway, a Dublin-born writer with three novels to his name — The Long Falling (1998), The Parts (2003) and Animal (2006) — as someone I really must investigate further. This definitely sounds like it packs a punch for only being 83 pages long. I’ll be on the look out for this one. Oh I love the sound of this book! It seems incredible that all this can fit into 83 pages but that said some of the most powerful books I have read have been short ones. This reminds me, Kim, which bookshops do you recommend in Dublin? I have four days there, though not all of them can be spent in bookshops LOL. I read this around four years ago and have yet to explore Ridgway’s novels (although I own them all). Horses is startlingly good and I consider it a favourite. May I recommend (possibly again) Marina Carr’s plays (especially By the Bog of Cats, The Mai and Portia Coughlan) and The Visitor by Maeve Brennan? P.S. Also Lamb by Bernard MacLaverty. This sounds excellent. That’s it added to the wishlist. Thanks for all your recommendations, Claire. Brennan and MacLaverty are already on the radar! I am always really impressed when an author wows me with something short, especially a novella for some reason. I think that anyone who can master that art is an author worth reading much more of! This sounds like a brilliant novella from an interesting author.